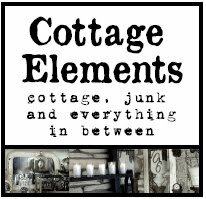 Cottage Elements: I'd Like to Thank the Academy . . . Okay, it may not be an Oscar, but I'm just as honored. 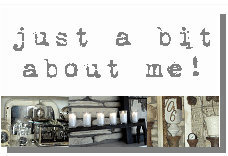 I received the Honest Scrap award from a few bloggers, and I've just been slow in posting it. My bad! But I would like to thank the academy, errr, actually ummm, Kim of The View of White Pine Lane, Jane of Fabulous Findings and Geo of Decorator to the Stars for this award. To receive an award from your peers, is well . . . like they like me, they really, really like me! So here are the rules that must be followed upon receiving this award: 1) Say thank you and give a link to the presenter of the award. 2) Share "10 Honest Things" about yourself. 3) Present this award to 7 other blogs. 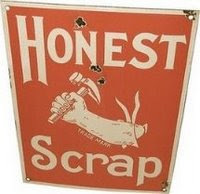 4) Tell those 7 people they've been awarded the HONEST SCRAP award and inform them of these guidelines. Now personally, I hate doing awards (oops, sorry), and I usually don't seem to get them passed on (sorry again). But I'll try to stay in the spirit of things, so here goes. I've done this before so I'll try to share some new things about myself. I met my husband at church. I was in a play and he came to almost all the performances. He sat in the front row! It must have been love! I love to travel and some day hope to visit Paris. I have a special needs daughter who loves hockey. She started skating at four after watching the Mighty Ducks. She now skates for her high school JV team the Andover Huskies, for the MN Special Hockey Team (for which she was the inspiration for it's start) and for the New Jersey Dare Devils Special Hockey Team. It is very cool! I love chocolate cake! Mmmmm! I tend to be a repurposer more than a creator when it comes to "junk" projects. I have two good friends both named Sue W. They both are extremely creative, and both were once gymnists. Weird! I love taking minnie vacations with the hubby to local hotels and bed and breakfasts. Good "us" time. I think I'm an internet-aholic. Ask my husband and kids. I may need therapy! I also am a collect-aholic. I collect scales, clocks, anything metal, numbers, letters, architectural pieces, brown transferware, restaurant ware, ironstone . . . you get the picture. Lastly, I believe in Jesus, as I know him. I believe in miracles as I have seen them. I believe in redemption as I have experience it, and I believe in forgiveness as I received it. Julie Pierce of The French Flea (she's a new blogger, but she get's this for all the fabulous things she does at The French Flea Occasional Market Place in Anoka). Sue Wolfe of DestinationArt. I know she doesn't post, but she definately deserves one for all her creativity! She rocks it! Lastly, but certainly not least, Rose of Second Hand Rose. 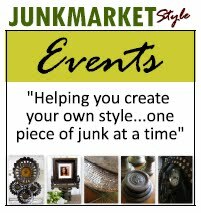 Another new blogger, but she's getting it for all she has done in the Twin Cities Metro Area (Mpls/St Paul) for starting the whole occasional sale craze. Where would we all be if it wasn't for her. You go girl! Whew! I made it through. These things are really a lot of work! I guess that's why I'm not a big fan of them. But I wanted to praise the above for all they have done, whether by blogging, or just encouranging and inspiring. Thanks to each and everyone! PS To those who received it, no need to feel you have to continue this award. Just wanted to know you are appreciated! PSS And for those like me who don't like a TON of reading, but prefer a TON of pictures, my apologies! LOL! PSSS This is my 100th post!!!!! I am having a give-away soon! How soon? Very soon! Thanks Lani! Those "awards" are hard work and I usually don't do them either! :-) Fun to know more about you, though! On behalf of all of us at SECOND HAND ROSE - thanks for the award Lanette! I thanked you on our blogspot and tried to leave a link to you - but haven't quite got all the ins and outs of this blogging thing together yet! I'll work on it - after I get my spot set up this weekend!